You know what time of the year it is??? It's the time of year where everyone, ok maybe just me is running around like a chicken with my head cut off to make Christmas cards. Here's one I'm sending to a friend who LOVES penguins. For more information on this project feel free to visit me at The Squeaky Scrapper. Royal Shoppe and you won't be disappointed - they give life to all your projects :) Warning: they are addictive! You still have time to join our Current Challenge, but don't delay because there will be a new one starting tomorrow. We would love it if you would become a follower of our Action Wobble blog and "Like" us on Facebook and share your Wobble projects with us. That is the cutest card! 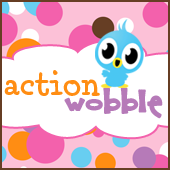 Love the action wobble too - thank you for sharing! Have a wonderful day! Super Duper Cute ! !Love your penguin!! Ho Ho Ho, Merry Christmas!! !